This paper is an outgrowth from the Tri-Univeristy History Conference in March 2016 at the University of Guelph. The author would like to thank Geoff Hayes, whose feedback enormously strengthened the paper. The author also extends his gratitude to the external reviewer. 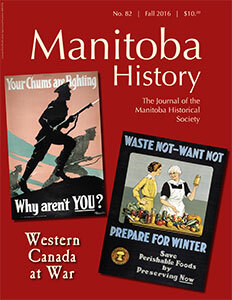 Research funding was provided by the Manitoba Historical Society. 1. Letter from A. Y. Jackson to A. W. Cameron, 29 November 1926, Archives Artwork Binder, uncatalogued, University of Saskatchewan Archives & Special Collections (hereafter, UASC). The binder of letters sent between the collegiate and the contributing artists to the memorial art gallery are available at http://saskhistoryonline.ca/islandora/object/islandora%3A32794. 3. Paul Fussell, The Great War and Modern Memory, Oxford: Oxford University Press, 1975. 4. Jay Winter, Sites of Memory, Sites of Mourning: The Great War in European Cultural History, Cambridge: Cambridge University Press, 1995, p. 5. 5. Jonathon F. Vance, Death So Noble: Memory, Meaning and the First World War, Vancouver: UBC Press, 1997, p. 6. 6. George Robb, British Culture & the First World War, 2nd ed., London: Palgrave Macmillan, 2015, p. 181. 7. Steven Trout, On the Battle of Memory: The First World War and American Remembrance, 1919-1941, Tuscaloosa: The University of Alabama Press, 2010, p. 2. 9. For veterans’ return home, see Desmond Morton and Glenn Wright, Winning the Second Battle: Canadian Veterans and the Return to Civilian Life, 1915-1930, Toronto: University of Toronto Press, 1987. For the most recent work on shell-shock in Canada, see Mark Humphries, “War’s Long Shadow: Masculinity, Medicine, and the Gendered Politics of Trauma, 1914-1939,” Canadian Historical Review 91, no. 3 (2010): 503-531. 10. Vance, Death So Noble, p. 202. 12. Charles Smith, “Problem of a Suitable Memorial,” Saskatoon Phoenix, 4 March 1919. 14. John Cairns used it in his speech, “J. F. Cairns’ Big Message.” It is also used in Don Kerr and Stan Hanson, Saskatoon: The First Half-Century, Edmonton: NeWest Publishers, 1982, pp. 45, 70. 15. “A Memorial Hospital,” Saskatoon Phoenix, 19 March 1919. 16. “Hot Debate on War Memorial at G. W. V. A. Meet,” Saskatoon Phoenix, 22 March 1919. The GWVA was a powerful veteran lobbyist group formed in 1917. It held the most influence amongst the various veteran organizations across the country, until it, and a number of others, merged in 1925 to form the Canadian Legion. 17. “Saskatoon’s War Memorial,” Saskatoon Daily Star, 27 March 1919. 20. To avoid confusion, I have decided to use “Nutana Collegiate” throughout this essay, despite it being named “Saskatoon Collegiate Institute” until 1923. 21. “Collegiate Will Honor Students Killed in War,” Saskatoon Daily Star, 29 March 1919. 22. Vance, Death So Noble, p. 240. 24. Letter from A. J. Pyke to F. M. Bell-Smith, 15 April 1920, Archives Artwork Binder, uncatalogued, University of Saskatchewan Archives & Special Collections (hereafter, UASC). 26. Cynthia R. Comacchio, The Dominion of Youth: Adolescence and the Making of Modern Canada, 1920 to 1950, Waterloo: Wilfrid Laurier University Press, 2006, p. 101. 27. See Vance, Death So Noble, pp. 35-72, 136. 30. The Collegiate Hermes, 1919, Saskatoon: Students of the Collegiate Institute, 1919, pp. 48-49, LHR. 31. Letter from Alfred J. Pyke to Mr. Mitchell, 9 July 1920, Archives Artwork Binder, uncatalogued, UASC. 32. H. M., “The Memorial Art Gallery,” The Memorial Art Gallery, 1924, LH-613, LHR. 34. “Editorial,” The Salt Shaker 3, no. 6 (30 May 1924): 1, Box 7 – Salt Shaker 1923-1932, Nutana Archives Room. 35. The Collegiate Hermes, 1919, p. 41; “Memorial Art Gallery Funds: 1924 Receipts,” Box 21 – Memorial Art Gallery History, Nutana Archives Room. 36. The Collegiate Hermes, 1926, LH STOR, LHR. 37. The Collegiate Hermes, 1919, p. 37. 38. The Collegiate Hermes, June 1927, p. 44, LH STOR, LHR. 39. “Saskatoon Recalls Sacrifices of War: Fine Art Gallery for Students Who Fell is Dedicated,” Saskatoon Phoenix, 12 November, 1927. 40. Comacchio, The Dominion of Youth, p. 115. 41. Eric Hobsbawm, Invention of Tradition, Cambridge: Cambridge University Press, 1983. 43. Thirteen of the twenty-nine who died from Nutana Collegiate during the war were also either current students or alumni of the University of Saskatchewan. See University of Saskatchewan Great War Commemoration Committee, “U of S Great War Database,” RememberUS, accessed 18 August 2016, http://greatwar.usask.ca/names?page=browsename&field=kdw&search=HR. 44. Don Kerr, “Nutana Memorial Art Collection,” Saskatoon History Review 23 (2010): 19. 45. Letter from David Wilkie to Alfred J. Pyke, 5 June 1919, Archives Artwork Binder, uncatalogued, UASC. 46. The Memorial Art Gallery, 1924. 47. Brandon, Art or Memorial?, p. 23. 48. Letter from A. J. Pyke to F. M. Bell-Smith, 15 April 1920; Letter from Principal Saskatoon Collegiate Institute to Mr. Thomas W. Mitchell, 16 April 1920; Letter from Principal to Mr. Homer Watson, 8 March 1922; Letter from A. J. Pyke to Mr. Archibald Browne, 10 March 1922, Archives Artwork Binder, uncatalogued, UASC. 50. Letter from Principal Saskatoon Collegiate Institute to Mr. Thomas W. Mitchell, 16 April 1920; Letter from Thomas W. Mitchell to A. J. Pyke, 26 April 1920, Archives Artwork Binder, uncatalogued, UASC. 51. Letter from E. Wyly Grier to Alfred J. Pyke, 10 April 1923, Archives Artwork Binder, uncatalogued, UASC. 53. Letter from Principal to Miss Marion Long, 13 March 1924, Archives Artwork Binder, uncatalogued, UASC. 54. See Kerr and Hanson, Saskatoon, pp. 267-275. 57. Cameron wrote Grier of his desire to include the “three important phases” of Nutana school life. Letter from Principal to Mr. E. Wyly Grier, 8 May 1924, Archives Artwork Binder, uncatalogued, UASC. 58. The Memorial Art Gallery, 1924. 59. Comacchio, The Dominion of Youth, p. 115. 60. Letter from Principal to Mr. E. Wyly Grier, 8 May 1924, Archives Artwork Binder, uncatalogued, UASC. 61. Letter from A. W. Cameron to Mr. E. Wyly Grier, 27 June 1923, Archives Artwork Binder, uncatalogued, UASC. 62. For school memorials, see Mark Connelly, The Great War, Memory and Ritual: Commemoration in the City and East London, 1916–1939, Suffolk: The Boydell Press, 2002, pp. 81-91. 63. Jonathan Bordo, “Jack Pine – Wilderness Sublime or the Erasure of the Aboriginal Presence from the Landscape,” Journal of Canadian Studies 27, no. 4 (1992): pp. 98-128. 64. Comacchio, Dominion of Youth, pp. 113-14. 65. Kerr and Hanson, Saskatoon, p. 268. 66. Letter from A. W. Cameron to Fred S. Haines, 8 December 1926, Archives Artwork Binder, uncatalogued, UASC. 67. See Letter from Charles W. Jefferys to Mr. A. J. Pyke, 17 July 1920; F. M. Bell-Smith to A. J. Pyke, 24 April 1920, Archives Artwork Binder, uncatalogued, UASC; Letter from T. G. Greene to Alfred J. Pyke, 26 April 1920; Letter from W. Greason to A. J. Pyke, 18 April 1919, Archives Artwork Binder, uncatalogued, UASC. 68. Letter from Emile Walters to Mr. Cameron, 29 December 1924, Archives Artwork Binder, uncatalogued, UASC. 69. Letter from Emile Walters to Mr. Cameron, 23 February 1925, Archives Artwork Binder, uncatalogued, UASC. 70. E. Lisa Panayotidis and Paul Stortz, “Visual Interpretations, Cartoons, and Caricatures of Student and Youth Cultures in University Yearbooks, 1898-1930,” Journal of the Canadian Historical Association 19, no. 1 (2008): 195-227. 71. See Gordon Johnson, “Life is Eternity,” The Collegiate Hermes, June 1923, p. 38, LH STOR, LHR; Evelyn Cox, “Our Memorial,” The Collegiate Hermes, June 1923, p. 38, LH STOR, LHR. 72. The Collegiate Hermes, June 1927, p. 40. 73. The Collegiate Hermes, Xmas Number, 1926, p. 37, LH STOR, LHR. 74. Walter Murray, “Nutana Collegiate Memorial,” MG61S1 A. VII, J. E. Murray Papers. UASC. 75. Reta G. Willard, “Prairie School Memorial To War Heroes Takes Form of Canadian Art Gallery,” Vancouver Daily Province, 23 January 1927. 76. A. Y. Jackson, “The War Memorials: A Challenge,” The Lamps, December 1919, p. 76. 78. Letter from Harry Britton to Alfred J. Pyke, 9 July 1919, Archives Artwork Binder, uncatalogued, UASC. 79. Vance, Death So Noble, p. 206. 80. Letter from Harry Britton to Alfred J. Pyke, 9 July 1919, Archives Artwork Binder, uncatalogued, UASC. 81. Letter from F. M. Bell-Smith to A. J. Pyke, 19 May 1920, Archives Artwork Binder, uncatalogued, UASC. 82. Letter from A. Y. Jackson to A. W. Cameron, 29 November 1926, Archives Artwork Binder, uncatalogued, UASC. 84. Vance, Death So Noble, p. 74. 85. Letter from AWC to Mr. A. Y. Jackson, 7 January 1927, Archives Artwork Binder, uncatalogued, UASC. 88. “Saskatoon’s Memorial Art Gallery,” Saturday Night, 7 August 1926. 89. Frank Yeigh, “A Bystander at the Office Window,” The Globe, 30 September 1926. 90. Frank Yeigh, “Western Canada in Confederation Year,” The Globe, 3 June 1927. 91. “Art Exhibit,” Saskatoon Star-Phoenix, 23 July 1930.